For all my life, since discovering this fabulous, funky, pungent, tuber I have used it at home in the form of truffle oil. A few times, on very special occasions, I have had it in a restaurant shaved over pasta as a very special treat. Special because white truffles are so expensive. Truffle oil isn’t exactly cheap, you can easily spend $20 on a tiny bottle, often with a miniscule flake of white truffle in it. Last week I saw a video where Joe Bastianich describes Truffle Oil as: garbage olive oil with perfume added to it. To boot he also says: it’s hard to digest and you shouldn’t eat at restaurants that serve it! The first thing I did was go on the website of Eataly which Joe is one of the founders of, to see if this mega mall of all things Italian sold it: they do not. Then I asked Wikipedia who only further deflated any ideas I might have of ever using this hitherto magic oil again: Most “truffle oil”, however, does not contain any truffles. The vast majority is olive oil which has been artificially flavored using a synthetic agent such as 2,4-dithiapentane. Yum. 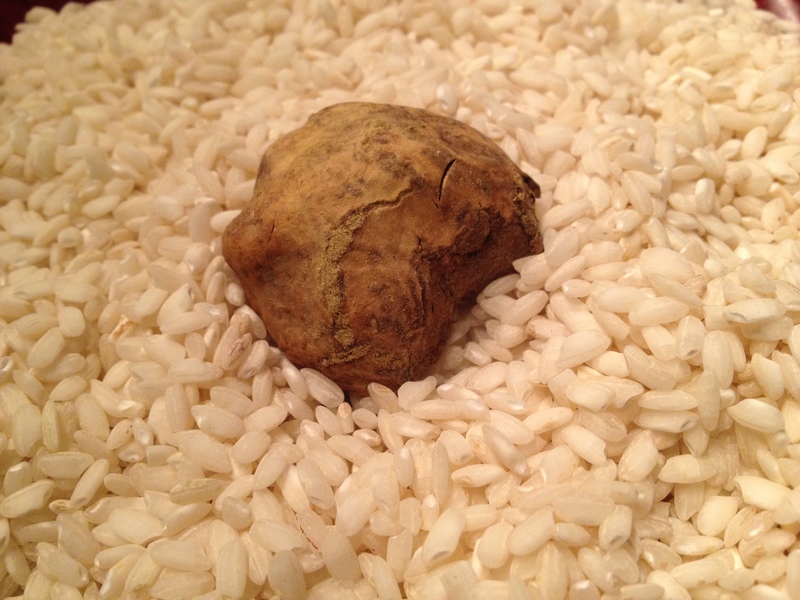 So I went to my favorite Italian grocery store Buon Italia and bought myself a white truffle as a birthday present. Everyone said I should smell it before I bought it, I did and it immediately convinced me that it was worth every dollar of the $112 this slightly more than an ounce truffle cost. For those wanting to buy in bulk these particular tubers were selling for $1600 a pound! Of course before you can do anything with your smelly little splurge you need to have a truffle shaver. Thankfully my friend Jane had one. Both Jane and my brother David told me that truffles were packed in rice. Mine was packed in brown paper in a plastic container, so I immediately replaced the paper with some risotto rice which over night infused the rice with the amazing smell of white truffle. Needless to say I can’t wait to make risotto this weekend. I had bought 2 different kinds of Taleggio an older creamier one which was $26 a pound and younger firmer one for $14. The cheaper one was easier to cut and melted better – it didn’t get runny like the aged one, so if you decide to use Teleggio don’t splurge on the expensive one. It was dark and I was starving, so this picture is more moody than instructive. This is the Chanterelle version. Mushrooms and Truffles have a natural affinity to each other. This is really a non recipe, as there are so many variations, but in general terms hows I want about it: Make your favorite pizza dough (see mine below), add cheese cook at the highest heat your oven will go (500 F is what I use) for about 15 minutes or so until the crust is brown and the cheese bubbling. Take it out of the oven and let rest for 2-3 minutes then shave white truffles all over it. Trust me it is worth the splurge. Now I need to figure out if I can make my own truffle oil with good olive oil and some of the truffle I have left? 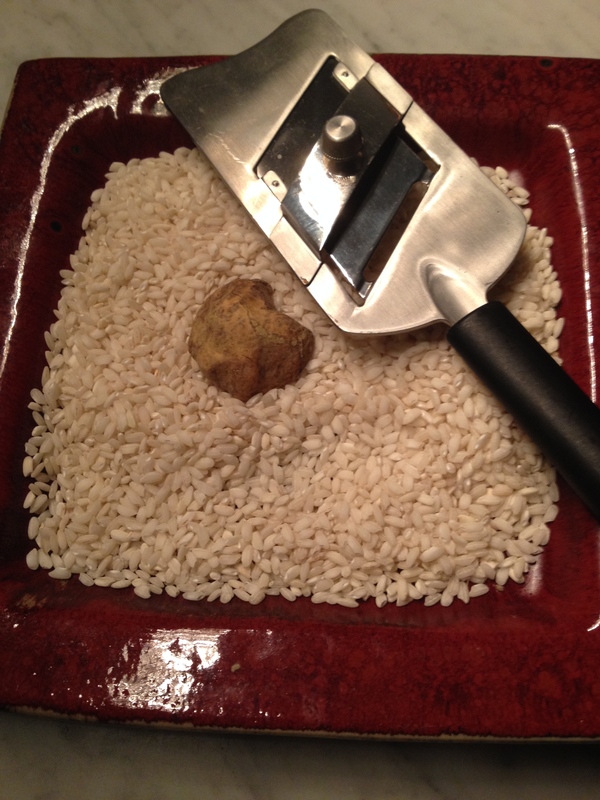 I’d love to hear about any white truffle stories you might have or what some of your favorite things to make are that you use truffle with. In the bowl of a standing mixer with the paddle attachment add: 2 Teaspoons instant yeast, 2 teaspoons salt, 1 Teaspoon Sugar, 3 3/4 cups bread flour. Turn the mixer on low to incorporate all the dry ingredients. Turn the mixer off and add: 1 1/2 cups of tepid water. Turn the machine back on to medium speed until the dough forms a ball. It should be sticky, if it is too dry add a little more water. Once the sticky ball stage has been reached turn off the mixer, sprinkle some olive oil over the dough and with greasy hands knead the dough into a ball and place back into the now well oiled bowl. Cover well, I use a recycled plastic bag then a tea towel (I have a thing against plastic wrap). Keep in a warm place until the dough has doubled an hour to 2. Preheat your oven to 500F and if you have one, place your pizza stone on the bottom most level of your oven. When the dough is ready to make 2 pizzas turn it out onto a work service and cut it into 2 pieces with a sharp knife or dough cutter – dough pull it apart. If you use a sheet pan use the entire amount. Once you have spread the dough out let it sit for 5 minutes or maybe a little longer before added your toppings. I do this because it acts as a mini second rising, I like a slightly chewy dough with substance. Bake in your preheated 500F oven until cheese is melted and the crust is brown (about 15minutes). Always use a spatula to lift the pizza up to make sure the bottom of the pie is nicely browned. 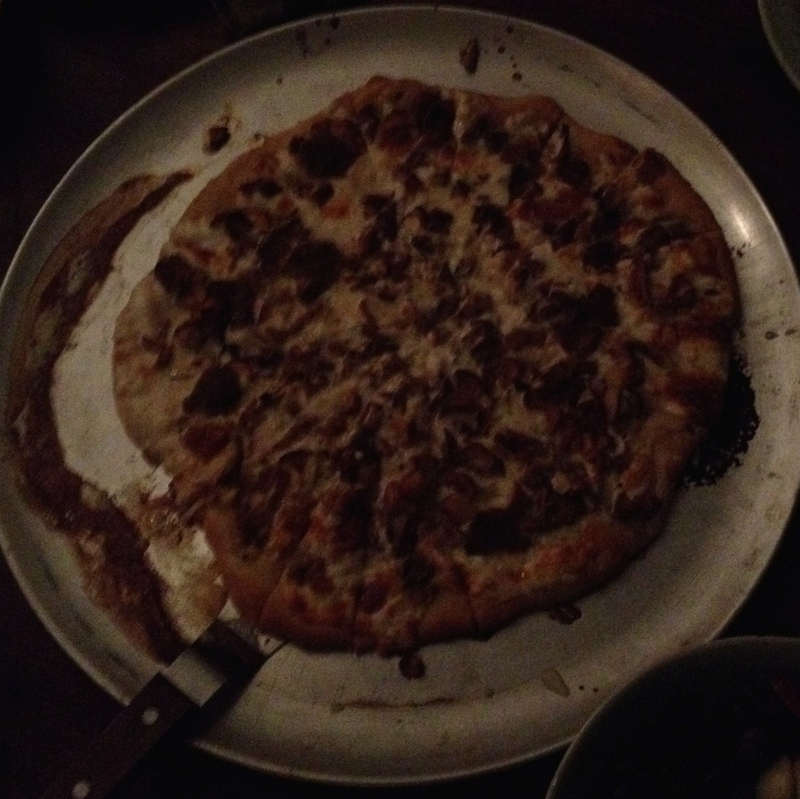 This entry was posted in NYC, Other Stuff, Recipes and tagged Buon Italia, Eataly, Joe Bastianich, pizza dough recipe, Taleggio Cheese, truffle oil, white truffle, White truffle Teleggio pizza. Bookmark the permalink.